hungry for food, hungry for traveling, hungry to just live life to the fullest! This is a Flickr badge showing public photos from Scream for SourCreamTimbits!. Make your own badge here. Gorgeous outside and tart on the inside! Fresh picked Ontario Strawberries.. I'm gonna get 'cha myself this weekend! Is it the summer breeze? Or is it because school is almost finished and I get to relax even more? Oh no, probably it's because I'm overjoyed by my foster cat and an addition of a cute foster kitten? I feel thankful that I got a chance to take a very interesting course, Human Nutrition. There has never been other course as interesting, practical, useful, eye-opening like this one! My professor is very knowledgable and resourceful. It wasn't a waste of time [and money] at all! Because of this course, I am more informed about my food decisions and have begun to revise it. You all know that we can eat healthy and still have a lot of fun, right? Well, right now I have one food blogger to thank. No, I don't really know who she is. Just that she also lives in Toronto and very passionate about food and cooking. Her food blog is one of the blogs I frequently visit. 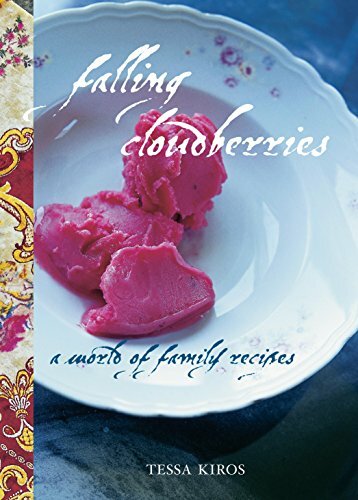 Not only does she present beautiful foods, but also the stories behind it which makes me fall in love with most of the recipes she shared so far. Makes me want to get that feeling as described in the story! Many of the recipes she shares end up being intriguing for me. Beside that, she lives in the same city as me, so it's only natural that we have the same fruits and vegetables in season. It is also possible that we have a relatively similar mood for food due to the weather. When I read her artichoke posting, I knew I had to give it a try as soon as possible. 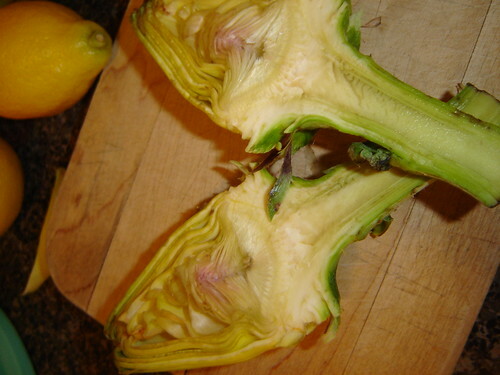 But, a couple of visits to the grocery store left me empty-handed with artichokes. I wish I live next to St. Lawrence Market. However, on my third visit [I can go as often as I want since I have the amazing Metropass], artichokes are finally up on the produce section!! I can't wait to put Ivonne's recipe into practice. Also can't wait to make the best-tasting risotto I've ever made into my dinner table again! [although I literally have no dinner table at home]. Although the name doesn't say much about its taste or flavour, it really was the best homemade muffin I've ever tasted! 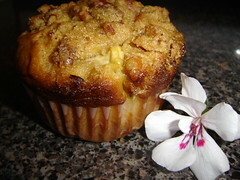 The muffin is not greasy at all like the muffins that use butter and the savoury streussel picks up the lack of butter. The addition of citrus zest [I used orange] really made the batter fragrant, making every bite enjoyable. Without any artificial additives normally used by commercial bakery, these muffins are truly the best and healthy! I don't really know what the prupose of this entry :) I'm just excited to get to try new great recipes and get amazing results that I want everyone else to try them as well. 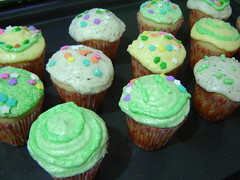 Oh, before I forgot, my sister actually tried the cupcakes recipe in Ivonne's website as well. This so-called Vanilla Flirt brings forth an enjoyably moist yet light cakes in tiny cups. Since these cupcakes are very sweet and creamy, I enjoyed eating it with a cup of 1% milk. And, thanks again, Ivonne ! Summer surely brings a lot of joys, colours, and feelings like never before. This is my first summer ever in Toronto and I've never experienced summer in a four-season country before this. I am very grateful that my parents let me stay in Toronto for at least the first two months of spring-summer. Everywhere I go I'll see fresh fruits and vegetables popping up at every corner. 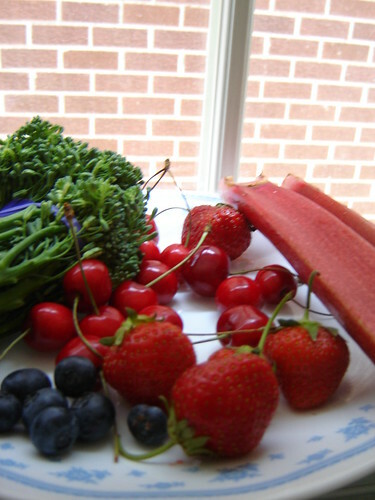 Fresh, farm-picked strawberries, rhubharb, asparagus, green peas... The colorful mangoes, Rainier cherries, tomatoes, peaches, nectarines, watermelon, the fruits-and-veggies list will go on forever. It feels so good to be surrounded by these fresh produce, especially when a lot of them are grown in Ontario land. This makes summer feels so wonderful. Amidst this joy for the abundance of fruits, I want to take a while to participate in the one-time event hosted by the super-talented Sam of Sweet Pleasure. I hereby announce my participation in Ice Cream Blogging! 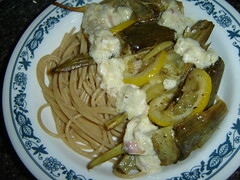 It's a very simple recipe that only requires very little amount of sugar, compared to what was suggested by the recipe. I picked the red-and-green skinned mangoes as my main ingredient. I still don't know what the proper name for these mangoes are. Remember that as soon as you got home after buying these mangoes, do not put them in the fridge unless it's already ripened. I carelessly put mine in the fridge before they were fuly ripened that I had to wait another few days before I can start making this particular gelato. Actually, I am not sure whether to address this freshening icy treat as gelato or sorbet. Since this does not contain any milk or cream; rather only pure mango, water, and sugar; perhaps addressing it a sorbet would be better. This recipe is particularly simple and require little preparation. Since I don't have an ice cream machine, I had to occasionaly churn the sorbet once in a while until it reaches the consistency that I liked. And the result is the beautiful sorbet presented above. 01. Combine everything in a blender, then liquify everything until smooth, around 5-10 minutes. 02. 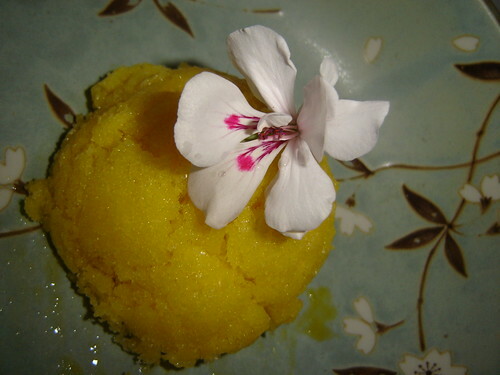 Pour the liquid mango into a freeze-proof plastic container or an ice cream machine. If you're using an ice cream machine, follow the manufacturer's instruction. However, if you don't have one, please follow the remaining instruction. 03. Place the container, covered with a lid or a plastic wrap, in the freezer. After an hour, remove the container from the freezer, give an energetic whisk with a hand whisk or electric mixer and return to the freezer. Whish again after another couple of hours. When it's nearly firm, give one last whisk. Freeze again until firm. Then, you're goo to go! On Saturday, the hottest day of the week by far, I went to Canada's Wonderland with Mr. W.
Familiar that prices of foods in amusement parks and other entertainment centres (the theatre, resorts, etc.) 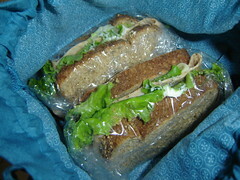 have inexplicably high markups, I packed my cute lunch bag with a ham-and-lettuce sandwich. Hoping to stop the hunger, thus disconnecting my eyes to look around for foods. The sandwich looks good to me. And, I've been having it for a lot of lunches these days. I like it best with a lot of fresh lettuce, and mayonaisse of course. 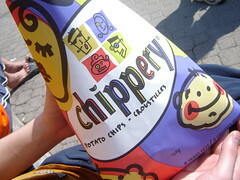 However, on this 2nd trip to Wonderland, I have the intention to buy a big bag of potato chips from The Chippery. 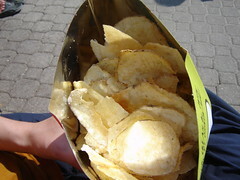 This one of a kind freshly made potato chips is by far the best potato chips. It's unlike other bagged potato chips since it manages to retain the wholesome potato flavour within. This feeling of eating something real will not be present had I bought a bag of, say, Lays potato chips. As you can see, I very much praise this potato chips. A while ago, I still could find them at BCE Place Richtree. And sometimes on Dundas Square. But they have long disappeared and revealed themselves when I first visited Wonderland. I had a craving for Chippery, so I bought the 5 oz bag instead of the 2 oz one. And I get to mix 2 flavours, sea salt and sourcream & onion. I found the sea salt to be overly salty, I'd appreciate a more subtle saltiness and more potato-ey flavour. Next time, I'm gonna try the ketchup flavour. Can you believe it? We only got ourselves to one ride twice and that's about it! Wonderland on a weekend is very much packed with people. We went on Timberwolf twice and got splashed really hard on the splash zone for around 4 times. It was so much fun playing with water on an especially hot day. We got ourselves soaked and had to change clothes. I felt so refreshed afterwards! On the way going out of Wonderland, we stopped by at a candy shop near the entrance. At first I wanted to buy a stick of sour-apple rock candy. Then, my eyes caught the sight of candied apples! Oh, how long have I been craving for them! 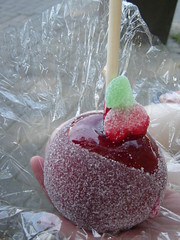 I can never forget the delightful taste of candied apple caramel I had when I went to Niagara. My choice this time fell to the Super Sour Candied Apple with Sour Sugar. That seems challenging! Since we didn't eat any real meal during our trip, I felt like I have to prepare something decent at home. I knew just what I wanted to eat. 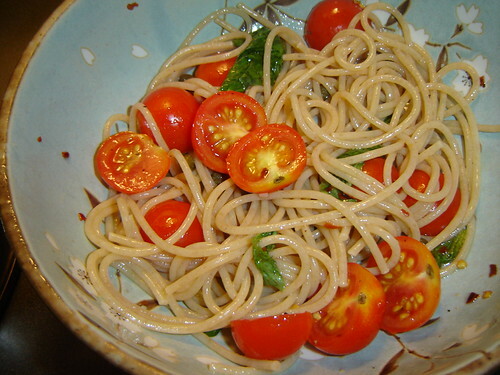 Fresh Tomato Pasta! I've had this one before and it was so easy to prepare with maximum satisfaction. I followed the recipe from Falling Cloudberries closely, except I don't have any EVOO handy, so I added squirts of lemon juice. It should taste even better with it. 01. Put all the ingredients except the spaghetti in a bowl and season with salt and pepper. Leave for at least an hour to let the flavours mingle. 02. Cook the spaghetti in a large pan of boiling salted water. Drain and add to the tomato sauce, tossing well to coat the pasta. Serve immediately, with or without grated parmesan. I realize that I haven't touched this blog for almost two weeks, which is quite a long time. My excuse for not writing... A LOT! First , and I think I've mentioned this, my summer class is pretty intensive since we're squeezing a 4-month long course into 2-month long. The lecture is every other weekday plus a tutorial. Only one course, though. One interesting course, which I bet other food blogger would find it interesting if they have a chance to take it. This so-calles Basic Human Nutrition course encompasses all nutritents, macro and micro, in our diet along with their basic functions, chemical properties, metabolism, and so on. This course basically teaches you the basics of what we eat, nutrition. This could go on forever, why don't you buy the textbook? To make things more handy and practical, I am attempting to present you with some variety of what can be called a healthy and tasty breakfast. I'm going to use the software required in this course to calculate the nutritional value in each of these foods. Bear with me please, I'm new at this! 01. Combine oatmeal, borwn sugar, and honey in an oven-proof dish [I used aluminium bowl from Chinese takeouts] and bake for 3 minutes at 250 degree F in a toaster oven [or stove]. Watchout, don't let the oatmeal burn. After 3 minutes, take it out from the oven, give it a stir, then proceed to prepare the fruits. The mixture will harden a bit [due to the crystalized honey and sugar] and will make a really nice crunchy granola. 02. 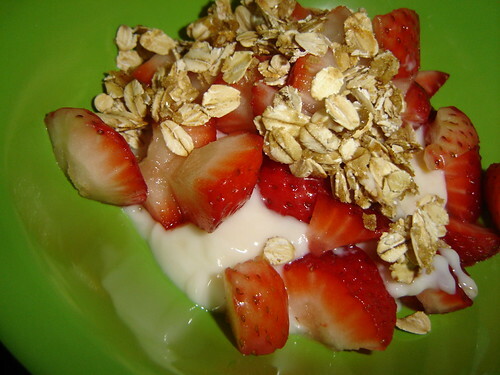 In a cereal bowl, pour the yogurt, the fruit pieces, and the granola on top. 03. Enjoy with a cup of orange juice or milk. Vitamin D 40% of D.V. 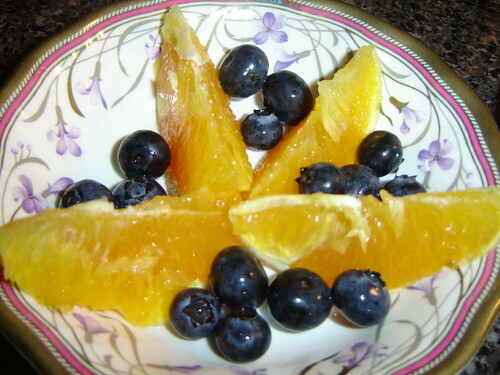 This choice of breakfast is a good source of Vitamin C, Vitamin D, and Fiber. Aside from that, it taste absolutely delicious and refreshing! In fact, I'm craving for a bowl right now. I'll see you soon on the next healthy eating edition! Do I have another excuse for neglecting my blog? Of course I do! I have recently picked my my 2nd foster cat! Yay, I'm fostering again! Her name is Tasha and she's been very lovely and calm. Her favorite spots include the study chair and behind the wheezing computer desk. They are here to mark the beginning of the Spring. Yet, they are disappearing as June is coming. Now we've stepped onto June first. I better go hurry and get them while they last! 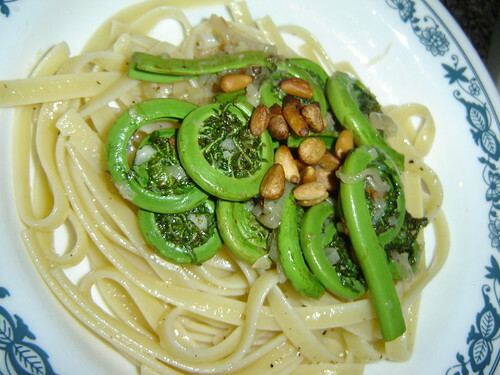 What's so special about this fiddleheads? I have no idea other than that they are only around in the spring, that I have never tasted them, and that they resemble so much like the vegetables I had back home called 'pakis'. Honestly, I'm just curious! And the best place to find them is at St. Lawrence Market. A little note from me: the cheapest one is at Phil's Place in the basement at $6.99 per lb. What makes it even more exciting is that Toronto Star's Food section [every Wednesday] has been featuring this lovely vegetable twice. With my level of curiosity building up and an array of new recipes to try, what more could a girl ask for? The way I presented this dish [to my sister and myself] was quick, easy, and a combination of different recipes and imagination. 01. 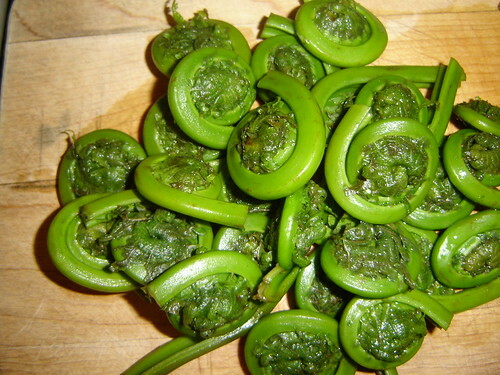 Add fiddleheads to medium pan of boiling, salted water. Cook 10 minutes. Rinse under cold, running water; drain well. 02. Heat canola oil in large skillet over medium-high. Add shallot. Cook, stirring, 1 minute. Add garlic. Cook, stirring, 1 minute. Add wine. Cook, stirring, 30 seconds. Add fiddleheads and chili flakes. Cook, stirring, 3 to 5 minutes or until peas are crisp-tender. Season well with salt and pepper. Remove from heat. Drizzle with lemon oil. 03. At the same time, prepare the fettucine bed. 04. Assemble to your preference and garnish with toasted pine nuts.